We’d love your help. Let us know what’s wrong with this preview of A Dying Light in Corduba by Lindsey Davis. To ask other readers questions about A Dying Light in Corduba, please sign up. Set in 73 AD: Our heroes Falco and Helena, who are shortly expecting their first child, travel to Spain on a mission to track down a murderer and uncover shenanigans in the olive oil market. Not one of my favorites in this series, but these are consistently amusing. I prefer the ones that are set in the city of Rome, which so far is about every other book. So I'm looking forward to the next one. The details of the olive oil business were interesting, and I liked the depiction of a wild teenage par Set in 73 AD: Our heroes Falco and Helena, who are shortly expecting their first child, travel to Spain on a mission to track down a murderer and uncover shenanigans in the olive oil market. 'A Dying Light in Corduba', #8 in the Marcus Didius Falco detective series, is an overcomplicated plot involving Roman and Baetican (Spanish) politicians scheming to monopolize the olive oil market. I was not convinced despite the complexity - it was a Rube Goldberg device from beginning to end. Oh well. Roman Falco takes his 7-month pregnant girlfriend, Helena Justina, to Spain at her insistence, despite the potential dangers of bad guys and to her pregnancy. She refuses to be left alone in Rome 'A Dying Light in Corduba', #8 in the Marcus Didius Falco detective series, is an overcomplicated plot involving Roman and Baetican (Spanish) politicians scheming to monopolize the olive oil market. I was not convinced despite the complexity - it was a Rube Goldberg device from beginning to end. Oh well. Roman Falco takes his 7-month pregnant girlfriend, Helena Justina, to Spain at her insistence, despite the potential dangers of bad guys and to her pregnancy. She refuses to be left alone in Rome. Falco had promised to be with her when the baby comes, so he agrees to let her travel with him. Back on the road, Falco travels to Spain and explores the all-important Olive Oil trade across the Roman empire. (And if you think for a moment that ancient trade was not a global phenomenon on a vast scale, look up Monte Testaccio). Expect a convoluted plot encompassing politicians and money, as well as agricultural and trade copnsiderations. I personally love the setting (having visited modern Cordoba), but this was a quick and lighter read than the previous volume in the series (Time to Depar Back on the road, Falco travels to Spain and explores the all-important Olive Oil trade across the Roman empire. (And if you think for a moment that ancient trade was not a global phenomenon on a vast scale, look up Monte Testaccio). Expect a convoluted plot encompassing politicians and money, as well as agricultural and trade copnsiderations. I personally love the setting (having visited modern Cordoba), but this was a quick and lighter read than the previous volume in the series (Time to Depart). Love this series! Falco is warm, funny, sometimes funny, sometimes cybical, always honest. The new series starring his adopted daughter, Flavia Alba, is excellent, too. The setting is a highly accessible take on Ancient Rome. Here our hero, Marcus Didius Falco, solves convoluted and often political crimes and lives an otherwise gentle domestic life with a great character of a wife called Helena. I'm scoring it a 3 because it's a relaxing read rather than a page turner but I'm reviewing it at all because it was a real pleasure to coast through, and the author's written A LOT of them - which is very good news indeed. I've been trying to read the Falco series in order, but when you're on holidays in small towns, you take what you can find. Davis has done some excellent historical research for this, as usual, funny and exciting crime novel set in ancient Rome (well, actually in Roman Spain this time) - everything you need to know about the politics surrounding the olive industry. This is my favourite novel in the series so far. Falco and Helena are never the conventional couple. As well as a rollicking good adventure we are supplied with a interesting travelogue of S Spain. Anacrites and his henchmen (woman) are a lively addition to the mix. I wonder what Petro is getting up to whilst Falco is out of town? Falco has been invited to a dinner with the Society of Olive Oil Producers of Baetica, along with The Chief Spy Anacrites. When two members of the party are attacked Falco travels to Baetica in Spain to track down and question witnesses. Along with a very heavily pregnant Helena Justina. I started to read the Falco series from the beginning and continue to enjoy them enormously. Marcus Didius and his partner, Helena, are well established as a couple and now seem like old friends to me. Roll on the next book. I enjoy all of the Marcus Didius Falco "hard-boiled" Roman mysteries. Although anachronistic (?) the humor is irresistable. And I love the the "love story". The one in Spain with the olive oil, the intrepid dancing girl and the birth of Falco's firstborn! A relatively satisfying Falco mystery, wandering around Spain. The end seemed a little rushed, and it missed out on some of the griminess of Rome, but good none-the-less. Falco, Falco, Falco - what are you *like*? I fear the man will never have any sort of regular reliable paycheck coming in, but constantly on call to the Emperor, running around what we call Europe at his beck and call. On less than minimum wage and no travel and subsistence payments either. On this occasion, our hero is invited to a rather obscure dining club event, where he bumps into two of his least favourite people - Anacrites, the chief Spy, and his beloved's younger brother, a proper little imperial snot if ever there was, fresh back from Spain. After having to play nice, and witness an less than talented 'dancer', whose main skill seems to be to wear as little as possible in a very suggestive style (SOP for dancers during the period of Rome I believe), Falco trundles off home, pleasantly drunk with two slaves trailing behind carrying an amphora of something his other half, Helena, will appreciate. The next morning, three things happen: Falco realises in his drunken stupor he has gone home to his former apartment, the Chief Spy has been attacked, and the rather polite young man he was casually speaking to has been found murdered. Oh law. Falco makes his way home to Helena with the amphora of goodies, where she is convinced he has spent the night in the arms of another woman. No sooner has he explained himself and made himself more respectable than he is summonsed to the palace - Vespasian wants a word, and who can say no to the Emperor? With an imperial nose firmly out of joint at the incapacitation of his Chief Spy, Vespasian smells a plot to upset his rule, and despatches Falco to Spain to track down a suspected nest of traitors out in the countryside. Falco refuses for good reason - Helena Justina is pregnant. Very pregnant and he has promised her he won't leave her for the birth, particularly as she has had two miscarriages before this. The Emperor insists. And Helena, game and stubborn as ever, sees no problem - she will go with Falco. So, armed with Imperial Seals, letters of recommendation and an investigation - plus a very pregnant unofficial wife, Falco sets forth. I've just learned how careful we have to be when buying olive oil and how we could be scammed no matter how careful we are. Now I've read this book which tells about a potential price cartel in the Spanish olive business in the time of the emperor Vespasian. Plus ca change as they say. There is a dinner for oil producers at the palace and Falco is invited for reasons he can't quite fathom. After the dinner Falco's sometime boss Anacrites the Chief Spy and one of his agents are attacked resulting I've just learned how careful we have to be when buying olive oil and how we could be scammed no matter how careful we are. Now I've read this book which tells about a potential price cartel in the Spanish olive business in the time of the emperor Vespasian. Plus ca change as they say. There is a dinner for oil producers at the palace and Falco is invited for reasons he can't quite fathom. After the dinner Falco's sometime boss Anacrites the Chief Spy and one of his agents are attacked resulting in the agent's death and Anacrites being severely injured. Falco is busy minding his own business, including keeping a careful watch on a seven months pregnant Helena Justina, when he finds himself hired by Laeta, one of Vespasian's chief secretaries, to investigate a proposed price cartel in southern Hispania, a plot that appears to be connected with the dinner Falco attended. He has promised to be with Helena right through her delivery so traveling to Spain wouldn't seem to be a possibility, but that is not taking Helena's determination into account. She claims that two months is ample to sail to Spain, settle the case and return in time for the Roman midwife to aid in the birth of the baby. Such a plan! I love Falco. 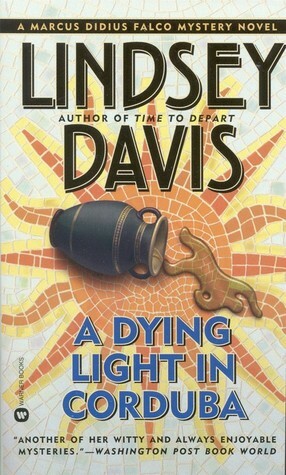 Lindsey Davis creates a wonderfully evocative world with her view of ancient Rome, and, this time, Roman Spain. Falco is in a bit of a bind- the chief spy has been very badly beaten after a dinner of Corduban Olive Oil Merchants, a beautiful and dangerous dancing girl is missing, and his significant other, Helena Justina is going to give birth any moment. What is an informer to do? Well, pack up everything and go to Spain. I find that the mysteries, while solidly created, are never t I love Falco. Lindsey Davis creates a wonderfully evocative world with her view of ancient Rome, and, this time, Roman Spain. I find that the mysteries, while solidly created, are never the main draw to these books. The way the ancient world is evoked, and the time spent with Falco, Helena and the cast of colorful characters are the main draw. This 8th in the series is set in ancient Rome in 73 A.D. Our hero is Marcus Didius Falco, a private informer (investigator) who is soon to be a father. He still hasn't managed to achieve for himself a position in society where he can actually marry Helena whose father is a Senator. The story is part detective novel and part romantic comedy with lots of historical adventure. These stories are always witty and this one involves a convoluted plot beginning in Rome and then ending in Corduba, Hispan This 8th in the series is set in ancient Rome in 73 A.D. Our hero is Marcus Didius Falco, a private informer (investigator) who is soon to be a father. He still hasn't managed to achieve for himself a position in society where he can actually marry Helena whose father is a Senator. The story is part detective novel and part romantic comedy with lots of historical adventure. These stories are always witty and this one involves a convoluted plot beginning in Rome and then ending in Corduba, Hispania (Spain). Falco has been invited to a banquet for the Society of Olive Oil Producers of Baetica. He is dismayed to find his nemesis Anacrites there who is the Chief Spy for Emperor Vespasian. Upon leaving the banquet he discovers that Anacrites has been severely beaten and another spy named Valentinus has been murdered. A dancer at the banquet named Selia and her henchmen are suspects. The Baeticans return home immediately after the banquet which is also suspicious. Claudius Laeta, one of Vespasian's chief secretaries, commissions Falco to travel to Corduba, Spain to check out a rumor and investigate whether or not a cartel is being formed to monopolize and fix prices in the growing olive oil business. Falco also wants to track down the dancer and bring her to justice. Meanwhile, it is up to Falco to take care of Anacrites who may be dying so he foists him on his mother to take care of. Helena is seven months pregnant, and Falco has promised he will be present at the birth. What a conundrum. Since they need the money and Falco needs to make the trip to Spain, Helena decides to go with him. This is an easy decision as her mother has been harping at her about the birth. They travel by water to make the trip easier for Helena, but not so easy for sea sick Falco. In Corduba Falco meets the new quaestor named Quinctius Quadratus who is sent fishing by the Proconsul so he won't muck up his new job. Falco and Helena stay at her father's olive farm in Corduba run by a tenant named Marius Optatus. He has a grievance with his former employer. The book was a little slow at the beginning, but by the beginning of Part Two (Chapter 19), the pace picked up, and I was thoroughly hooked. Davis presents wonderfully vivid characters, and she has a fine eye for historical detail. She ties in Falco's past, the events of the first Falco mystery, to add perspective to Falco's career and his relationship with Helena Justina. The ending seemed a bit rushed, but the situation presented in the beginning is neatly wrapped up. It takes me a little while to keep up with all the characters in the story. This story was very good. Following Falco is always entertaining and interesting. The political intrigue and complex thinking is really scary, thinking how and why people then, as well as now, think and act. A very good read. Maybe 3 1/2 but these books are a lot of fun to read. Falco is a reprobate - but also the charming hero. Step back into ancient Rome and follow him as he solves crimes for, among others, the emperor Vespasian. If you haven't read these before it's good to start with The Silver Pigs - #1 in the series, but after you know the characters any order is pretty much fine. Fast reads. Enjoyable series. Marcus Didius Falco and the heavily pregnant Helena end up in Hispania, chasing an olive oil cartel and a deadly dancing girl. This one was only ok, something about it just didn't work as well as the others for me. I found it dragged in a few places. This was an enjoyable story, probably my favourite of the travelling stories in this series so far. The political manoeuvring was well drawn, the characters (as always) were engaging, and of course, there was a good dose of very funny passages. Not a classic, no great world shattering, insightful book. But good. I didn't think I would rate it but it was an audiobook that had right author for Book vipers challenge (sad I know). Despite these unhelpful thoughts it was ok. Good story, easy to listen to. Fine. Another entertaining book in Lindsey Davis's charming series about Marcus Didius Falco, a detective in Ancient Rome. This one brings him and his pregnant patrician girlfriend to Spain investigating a murder and suspected cartel. Usual Lindsey Davis fare. Well written, well researched and a good read all round. Yet another hit by Ms. Davis. looking forward to the rest of the series. Usual range of Falco characters plus a journey to Spain together with lots of political intrigue and the Roman equivalent of party politics. Complex and rapidly fluctuating storyline. Interesting but I prefer the books set in Rome.